“A Last Stand for Lelu” is a half hour documentary about Lelu Island, the site of the proposed LNG plant and shipping berth near Prince Rupert. Lelu Island is in the middle of Flora Banks, the most important juvenile fish habitat for the entire Skeena River system, some of the most important salmon habitat in Canada. 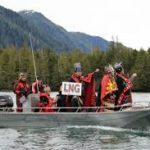 It is also on the traditional territory of the Lax Kw’alaams First Nations, who voted 100% “NO” for this project, refused a $1 billion offer from Malaysian state oil firm Petronas to put the LNG terminal on Lelu Island, only to see it being given a go-ahead by the BC provincial government. The film was produced and directed by Farhan Umedaly (VoVo Productions) and Tamo Campos (Beyond Boarding). 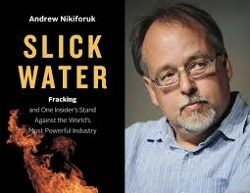 We will screen the film at 7:00 and then give the stage over to Andrew.